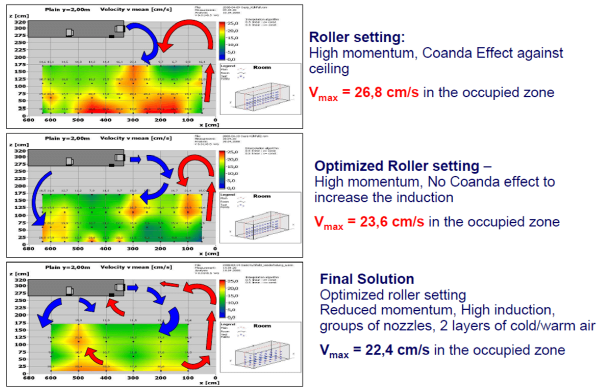 Optimization of comfort with LTG Air Flow Tests! Fresh air and pleasant temperatures determine comfort in rooms. For thermal comfort in modern buildings such as offices, homes, assembly areas or other structures, suitable ventilation systems and structural solutions must be sensibly combined. In actual practice, an incorrect design and regulation, or a particular installation situation, can lead to thermal discomfort in the frequented area and so to dissatisfaction of its users. To prevent that, it is recommended that an HVAC concept is validated as early as the planning phase that is based on a realistic room flow test under different load scenarios. The LTG room flow laboratories offer every option to do so: in a model test or in original scale, all load cases (full load, partial load cooling and heating) can be tested here and then assessed and optimized in line with current standards. We incorporate here all the planned ventilation components, supply media and internal and external loads (facade, solar radiation, people, lighting, equipment, machinery etc.) into the test in order to obtain a meaningful result. All comfort parameters such as temperature, flow configurations or speeds are measured, documented and finally optimised under secure, consistent and reproducible conditions – for maximum comfort. For an individual unit or an entire air-conditioning concept – LTG room flow tests will bring you an optimum result for every initial situation. We look forward to your contacting us!